As a Blogger blog owner, and being human, we occasionally make mistakes. If this were not so, the "Delete" key would be unused - instead of being the most worn down key on my keyboard. One commonly seen mistake, reported in Blogger Help Forum: Something Is Broken, involves deletion of our blogs. Help me! I just deleted my blog!!! This is a cry, seen almost daily. 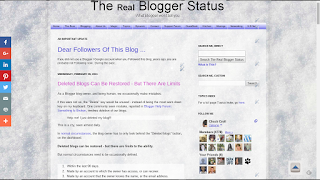 In normal circumstances, the blog owner has to only look behind the "Deleted blogs" link. Deleted blogs can be restored - but there are limits to the ability. But normal circumstances need to be occasionally defined. Made by an account to which the owner has access, or can recover. Made by an account that the owner knows the name, or the email address. Made by the owner, or an administrator. The "Delete permanently" option was not selected. If the URL was re issued - and somebody else chose it - you're out of luck. If the URL was made available to the world at large, and someone else has published to that URL, you're truly out of luck. Depending upon how you deleted your blog and / or Blogger account, the URL may have been freed up completely, and someone else may have later published to that URL. In that case, you're going to have to choose another URL, as the URL is now in possession of the new owner. To restore, you must use the "Restore" link on the dashboard. In order to access the dashboard, the blog owner must be able to login to the owning Blogger account, and find "Deleted blogs" in the dashboard blog selector list. To do this, we either need access to the account, or need to be able to recover access to the account. This isn't a trivial issue, for some Blogger blog owners, who have overlooked the need to maintain access to their blog. If you deleted the blog to transfer control, you must un delete it. If you deleted the blog under another Blogger account, hoping to transfer use of the URL to your current Blogger account, you wasted your time. You're going to have to un delete the blog under the other Blogger account - then transfer control of the blog, to this Blogger account. If you don't remember the account name, try to recover account access. If you don't remember the name of the Blogger account, under which you own a blog, you can possibly recover access to the account. Deleted blogs can't be queried, to recover the account name. The recovery information goes to the email account associated with the account, so access to the email account is required. You're going to have to brute force a recovery to the owning Blogger account. If the account itself was deleted, chances for restore grow smaller. When the owning Blogger account was deleted, the problem is even more complex. And with a blog that contained photos, hosted with Blogger / Picasa, still more so. And the recent necessitated custom domain authentication procedures may involve a DNS update, for blogs published to BlogSpot URLs. If "Delete permanently" was selected, you're out of luck. "Delete permanently" was a long demanded option, in Blogger. If you, or another blog administrator / owner, selected "Delete permanently", that's the end. And this is another case where anonymity creates problems. Once again, we see an example why using a bogus email address, to setup a Blogger account, just isn't a good idea. So Blogger has given us the ability to correct some mistakes - but recovering from this mistake carries with it some basic responsibilities. Deleted more than 90 days ago, or under another account - the blog cannot be un deleted, by you. 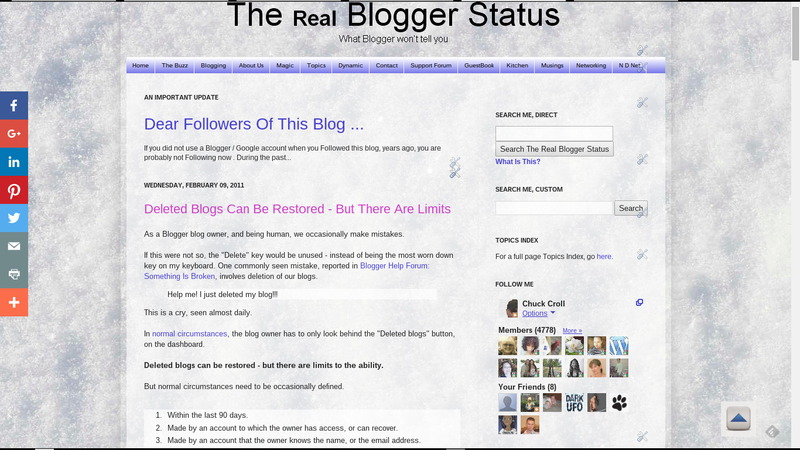 Some Blogger blog owners delete a blog -then return months later, asking to have it restored. Unfortunately, after 90 days, possibilities for restore are 0. If you delete a blog, it will be retained for 90 days - and no more. thanks for the info. i just recovered a deleted blog on mine a few days ago following the same tips you posted. but i have a related concern. if i delete a blog using, say, a url like popcorn143.blogspot.com, can the same url be used again by a different blogger account for a new blog? i tried, doesn't seem to work. is there a waiting period for the deleted blog url to be open for use again? What we have observed, in general, is that a URL, when the blog is deleted, is locked to the owning Blogger account, permanently. There is no waiting period - it's permanent, in most cases. If you want to let someone else use the URL, you have to un delete the blog (within the 90 days), then transfer control. If yuo waited over 90 days, the other (prospective owner) blogger is out of luck. Thank you for the information. Someone went into my account and deleted my blog. I was able to Un Delete the blog but my blog posts are all gone. Is there a way that I can get them back? Can you restore them for me? If you truly un deleted the blog, it should have been restored with all content. Did you maybe recreate it? If the blog was deleted by Blogger (not just "someone"), you have to get the blog reviewed, and restored.